Sandy Block, a respected MW from Boston, is one of the world’s most cerebral wine personalities. From his headquarters in Boston, he has directed the enormously successful wine program at Legal Sea Foods for the past 20 years. 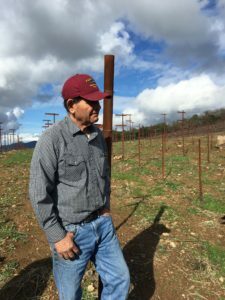 In his recent observations for a local trade publication, he turned his attention to California Pinot Noir, and the 2016 Placida Vineyard bottling from Neyers that we make from grapes grown by the celebrated Chuy Ordaz. ‘Tasting dozens of Pinot Noirs blind, it’s unmistakable how dramatically individual a story each one tells. The grape is a chameleon. Highly reflective of its specific growing conditions, Pinot requires handling with utmost care, both in the vineyard and the winery. Its thin skins bruise easily and are rot-prone in humid conditions; because it buds so early in the season Pinot Noir is frost-susceptible; if cropped at too heavy a load the wine it makes will taste dilute; and, to cap everything off, it’s genetically unstable. At a minimum Pinot Noir requires a long, cool, but sunny and dry growing season, the kind of environment where every vintage poses fresh challenges and requires a new strategy to handle the grapes. The net/net is that in a world and a market that prize predictability, Pinot Noir is by its very nature capricious. Its low yields and the intensive manual vineyard work (shoot thinning, pruning, leaf removal and other canopy work) needed to ensure flavor concentration mean that it’s never inexpensive to produce. Why do winemakers persist? When done right, Pinot Noir is incomparable, with an exalted perfume, texture and flavor profile whose every sip offers intrigue and surprise. The following California Pinot Noirs are among the finest I’ve tasted recently. One of the most appealing things about Zinfandel is that buying a bottle or two rarely breaks the bank. Many clock in around $30 or less, like the picks in today’s selection. These Zins come from all over California and are distinct to their terroirs, but each carries Zin’s hallmark fruit-forward appeal. Refined and well-structured, yet showing a briary streak, with appealing black cherry, sweet anise and white pepper flavors. Drink now through 2025. 1,172 cases made.—T.F. In my long association with Kermit Lynch, I logged more than 80 trips to France. The first one, in January 1992, was among the most exciting, and it began with the meeting of an old friend, George Lorentz. George and his family own Domaine Gustave Lorentz near Colmar, in the southern area of Alsace known as the Haut-Rhin. I stayed with them in 1974 during my first trip to France. In 1980 we were able to return their hospitality when George lived with us in St. Helena, and worked at Joseph Phelps Vineyards with me. When I was planning my 1992 trip to Alsace, George and I arranged to meet for dinner the day I arrived. After a brief visit with his parents at their home in Bergheim, we drove to Ribeauville for a dining experience that has been etched in my mind ever since. The culinary fame of Alsace is legendary, as the region is home to the greatest concentration of Michelin-star restaurants in France. 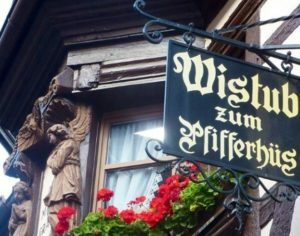 Rather than select a starred wonder for us that night, though, George planned dinner at a modest restaurant near my hotel – the casual Wistub Zum Pfifferhüs, in the lovely old village of Ribeauville. Our meal was simple but spectacular, and on George’s insistence it began with the onion tart, a dish for which the restaurant was apparently renown throughout Alsace. Aware of my fondness for red Burgundy, George had also brought from his cellar a bottle of Gevrey-Chambertin from a producer we both knew. After an obligatory glass of local Riesling and Gewürztraminer, we moved on to the Burgundy, just as the onion tart arrived at the table. I’ve had a lot of great food and wine combinations in my time, but I’ll never think of one any better than this. My main course was another specialty of the Wistub — the braised oxtail with spatzel — but as good as it was I found myself yearning for a second slice of the onion tart. Over the next two weeks, I enjoyed great meals in grand spots from Paris to Marseilles, but nothing was more memorable than that perfectly executed onion tart, accompanied by that delicious bottle of red Burgundy. I told Barbara about it when I returned home, and learned that she had cooked scores of onion tarts during her time at Chez Panisse and Auberge du Soleil. It’s not difficult, she said, and she baked one later that week. I devoured it with a bottle of red Burgundy from our cellar. Since then Barbara has continued to polish her onion tart recipe over the years, so when I recently brought home our just-bottled 2017 Pinot Noir ‘Placida Vineyard’ she decided it was onion tart time again. Once more, those bells and whistles went off in my head, and this time more than a few of them were directly attributable to the wine. Chuy Ordaz told us that the Pinot Noir from the 2017 harvest at his Placida Vineyard may have been the best fruit he ever picked from his property. The ground was still damp that spring and early summer from the heavy rain of the previous season, and the cold soil served to keep the growing temperatures comfortably low during bud break and flowering. The crop was small owing to the five consecutive drought years from 2010 through 2015, and the ripening was slow and even, giving us an almost perfect sugar to acid ratio when we harvested the grapes in late September. The parcel we work with is a two-acre block planted exclusively to budwood from the old Joe Swan vineyard in Forestville. These are ‘selection massale’ plants – not laboratory clones — developed from vines that originated in Vosne-Romanée, in the heart of the Côte de Nuits. Joe always maintained that the high quality of his Pinot Noir was due to the pedigrée of his vines. That night when we tasted the 2017 Pinot Noir ‘Placida’ for the first time since bottling, I was enormously impressed. We were both struck by the ethereal components that some refer to as ‘Burgundian Character’, a combination of aromas that include jam, earth, coffee, and tropical fruit. I remarked to Barbara that Tadeo had made a Pinot Noir ‘for the ages’ in 2017, one that we should expect to enjoy for many years. I plan to taste it often, and when possible accompany it with a slice of Barbara’s onion tart. I asked Barbara for her recipe, and it’s copied below. She says it’s really simple, especially if you use frozen puff pastry or pie dough from your local market as she does. Over low heat and stirring occasionally, cook onions in a heavy skillet with olive oil until tender and golden yellow. Approximately 45 minutes. Sprinkle with flour and continue cooking slowly for 2 to 3 minutes. Beat the eggs, cream, and seasonings in a bowl until blended. Gradually mix in the onions and half of the cheese. Pour into puff pastry or tart shell and spread the remaining cheese and butter pieces on top. Bake in preheated oven for 25 to 30 minutes until tart has puffed and browned. Golf isn’t a part of my life today, but there was a time – from around 1985 through 2000 — when both Barbara and I played often. It began when a neighbor of ours moved to Maui to take the job as tennis pro at the Kapalua Resort. We visited him often, and eventually he persuaded us to take golf lessons. After a few days of instruction, we went out for a round. We enjoyed the exercise, being outdoors in beautiful weather, and, of course, the cold beer at the end. Through him, we also met the resort’s golf pro, who soon suggested our winery be a sponsor of their Golf Tournament. We agreed. In exchange, he waived the golf fees for the rest of our trip. At the time, there were two 18 hole courses at Kapalua. The older Village Course was a bit more rustic, but it was slower paced, and far less crowded. We made a daily reservation there, and played early so there was little or no audience watching us fumble along our way. One morning as we began to head out for our round, the starter – with whom we had also become friendly — asked if we would like some company. He had another twosome without a reservation and he suggested they team with us. He introduced us, and jokingly mentioned that we could probably answer their wine questions. One of the players was retired football great Fran Tarkenton. He was joined by a former teammate, a lineman named Ron Yary. I knew we were going to be way over our heads, but the two of them were certain that it would be fine. Ron even mentioned that he did have some wine questions for us. I suggested that after playing together for a few holes they could play ahead of us. They declined, insisting that they always enjoyed the game better as a foursome. No one would ever doubt the athleticism of Fran Tarkenton, but he was effusive in his praise for Ron Yary, who he referred to as one of the most gifted players he knew. We went to the tee box for the first hole — a short, slightly uphill par 4 — and I hit a three iron that, while straight, didn’t cover much distance. But that was my game. Fran hit next and he creamed the ball, driving it almost to the green, but it sliced to the right, into the trees separating the 18th fairway. Ron hit his tee shot with even more power, but he hooked into a pineapple patch to the left of the green. From the ladies’ tee, Barbara – playing with her trusty five iron — hit her shot right down the middle of the fairway. We were outmuscled, but we played straight. I shot a par for that hole, Barbara hit a double bogey 6, and both Fran and Ron shot bogey 5. When we got to the second hole – all tied after one — Ron said to Fran loud enough for us to hear that he hoped they weren’t being sandbagged by Barbara and me. Their reputations were safe, but they still suggested we have a small wager on the game. I asked what “a small wager” was, and they proposed a dollar on the front nine, another dollar on the back nine, and a third dollar for low team score. We agreed. Well, it didn’t take long for the wheels to fall off as we caved in from the financial pressure. The sixth hole – a long downhill par 5 — was especially treacherous, and Barbara shot a twelve. I barely fared better, with a nine. Both Fran and Ron shot pars. The snack bar was at the 9th hole, and the starter met us there to see how the round was going. I apologized for our lack of competition and repeated my offer that they play ahead of us. They declined again, and said that playing with a foursome was an important part of the game. They both insisted on finishing with us. As we began the back nine, they began to ask us questions about the wine business. We told them about our vineyards and winery, briefly describing our wines. I also mentioned that my favorite restaurant in the area – the popular Bay Club – was one of the best customers for our Chardonnay. Soon enough we were teeing up for our shots down the 18th fairway – recognized as the narrowest par four on Maui. We spent very little time in that fairway, but fortunately, I had bought another dozen golf balls at the snack bar, so we had enough to finish the round. Fran and Ron were as affable on the 18th hole as they had been on the first, and both Barbara and I were delighted that these two talented athletes had been patient enough to play 18 holes of golf with us. We finished the hole, got into our carts and drove back to the starter’s shed to turn in our equipment. We walked to the nearby clubhouse, found an empty table, and ordered a beer. When the server arrived, I reached for my wallet to pay, but Ron was faster, and said, “Please, we’ve got this one.” He paid the server, took our scorecard and compared it to his. After a few strokes of the pencil and a slight furrowing of his brow, he said, “Looks like you owe us three dollars.” I paid him. We enjoyed another round of beer, and by this time our table was deluged by autograph seekers. Most of the people recognized Fran of course, but one young boy, pointing to Ron, asked who the other guy was, Fran didn’t hesitate. “Young man,” he said, “That person is Ron Yary, probably the best athlete I’ve ever known in my life. You should get his autograph.” Only a great athlete with enormous self-confidence could so ably redirect attention away from himself, towards a less famous athlete. How impressive. I’ve often thought about that moment, and reflected on what a great lesson it was. Later that night, Barbara and I went out to dinner at the Kapalua Bay Club, and as the hostess seated us she pointed in the direction of a table on the next level. “I think you have some friends dining with us tonight,” she said. I looked in that direction and saw Fran and Ron, just as both of them lifted an empty bottle of Neyers Chardonnay. There were six people at their table, and they raised their glasses in a toast us. Fran and Ron were a class act. The Carneros Chardonnay at Neyers Vineyards is produced using the most traditional Burgundian winemaking techniques. We work exclusively with hand-harvested fruit from three Carneros District vineyards, all of them planted to ‘Shot-Wente’ selection (see photo above). We ferment in 25% new French oak barrels from François Frères Cooperage in St. Romain, using native wild yeast. Secondary fermentation occurs naturally as well, with no added M/L starter. We just began to ship our 2016 Chardonnay ‘Carneros District’, and it’s as delicious as Chardonnay gets. Contact your local Trinchero Family Estates representative for pricing and availability information in your market. Thanks. Neyers Vineyards since we picked the Evangelho Carignan on August 27, it has been going slower than normal, thanks to some beautiful, chilly weather during much of September. This kind of ‘Autumn Chill’ is uncommon but oh so good for the grapes, permitting them longer ‘hang time’ to develop physiological ripeness, while maintaining high natural acidity levels. I remember similar harvests in 1975 and 1995, both of which were responsible for some of the best wines I’ve tasted in my career. Today was another milestone as we began to harvest grapes from our Conn Valley Ranch. Looking back, the last year we began picking on October 1 was – you guessed it — 1995. Last year, this same parcel – our house block Merlot – was picked on September 21. Moreover, the crop in 2017 was one of the smallest ever, a mere 2.68 tons from this 1.2-acre vineyard. This year the same parcel yielded 5.80 tons, or 4.83 tons/acre, still short of the Napa Valley average, but much better than in the past few drought years. 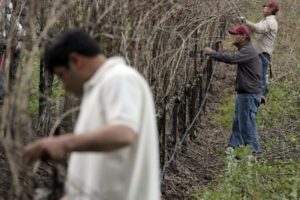 The crop size this year seems to be up across the board in Napa, due largely to the mild weather in May and June when vines were flowering — completing the self-pollination or grape fertilization process during which they are so fragile. A normal-sized crop of high quality is the stuff that Napa Valley dreams are made of, and this looks like the year, so far. If the weather stays warm and mild for another two weeks, prepare yourself for some of the best wines we’ve made in years. Barbara and I were out at first light this morning meeting with our crew, and minutes after the first bin was filled, she turned to me and said, “I don’t think they’ve ever looked more gorgeous!” That’s pretty high praise from a demanding grape grower. We had guests for dinner last week — a neighbor of ours and her daughter, who recently joined the family’s winery. The daughter brought along her boyfriend, a young Frenchman who was raised in the Beaujolais region, near Lyon, and now works in the Napa Valley as a vineyard manager. His parents, he told me, were not in the wine business, but they raised him to enjoy wine and food; as a result, he decided to study Viticulture in college. I told him that I loved the Beaujolais region — its wines, food and people — and how much I had enjoyed traveling there twice a year during my almost thirty years with Kermit Lynch. He asked if I had ever made it to Lyon for a meal at Restaurant Paul Bocuse. I had – just once – and it was as memorable as any meal I’ve ever enjoyed, anywhere. But before his untimely death in January of this year, M. Bocuse played another far more important role in my life. I recalled the details. I had finished my annual March trip to France for Kermit Lynch. My fifteen or so traveling companions and I were loading up our rental vans early on a Friday morning before leaving Chinon for Paris. After sixteen days on the back roads and highways – we had circumnavigated France from Nantes to Alsace to Marseilles, then back to Bordeaux – we’d driven to Chinon for a tasting on Thursday afternoon, followed by dinner in the nearby town. Everyone was particularly cheerful the next morning. The long days of tasting and travel were over, and we had an especially bright prospect ahead of us: a free afternoon in Paris on a beautiful spring day. After dropping the vans at Orly Airport, we taxied to our hotel in Central Paris. I asked everyone to meet me in the lobby at 7:00 that evening so we could leave for dinner together at one of my favorite Paris haunts. I had plans of my own for lunch that afternoon. I assembled a small group and we headed off to our lunch destination, Maison Prunier, one of Paris’ oldest and loveliest restaurants — located on Avenue Victor Hugo in the 16th Arrondisement, two blocks from the Arc de Triomphe. I had been there once before – earlier that year in January actually – at the suggestion of a restaurant friend. Our lunch group in January had been larger, and we’d been seated at a large table on the balcony overlooking the beautiful Belle Époque dining room. The meal was great that day, but the friend who had suggested the place later chastised me for not trying the turbot, the dish he claimed to be “the finest example of prepared seafood in the world.” We were returning to Maison Prunier in March so I could check-off an important block on my lifetime “to-do” list. We were immediately shown to our table, a comfortable six-top next to the window overlooking busy Avenue Victor Hugo. We quickly ordered a bottle of Champagne from the extensive list. We then began our meal with two orders of the house specialty — Assiette de la Mer, an assortment of fresh clams, oysters, shrimp, crawfish, lobster, and a few shellfish whose names we could only speculate about. For the main course I intended to stick to my plan and order the turbot. After learning that it was prepared for two, I persuaded my friend Peter that he needed to share this “best in the world” experience with me. He agreed. We finished four bottles of Champagne with the shellfish, and then moved on to white wine, choosing a single vineyard Meursault from one of my favorite Burgundian suppliers. My turbot soon arrived, and it was expertly fileted tableside by our server. By this time, he had enthusiastically befriended our entire group. I finished off the last morsel of my portion, and turned to Peter to see his reaction. “Well,” he said, “it may indeed have been the best piece of fish I’ve ever had.” I thought so too. We stood up and, continuing to clap, moved over to join the line. M. Bocuse meanwhile had reached the bottom of the staircase, and begun to enthusiastically shake hands, smile and make brief comments to the chefs — each of them immaculately done up in their kitchen whites, replete with elaborate toque. He continued to greet each person while gradually working his way to the end of the line. When he reached me, I extended my right hand and he grabbed it with both of his. He had a powerful grip. He looked at me and said simply, “Merci, Monsieur.” I’ve don’t think I’ve ever before been so touched; a tear filled my eye. Here was one of the most gifted chefs in the history of French Cuisine, a man who in one way or another was responsible for most for the great meals I’d enjoyed in my life, and he was thanking me. When he reached the door, a young man helped him into the limousine waiting outside the restaurant entrance, and the car drove off. Peter and I returned to our table, still in a mild state of shock. One of my colleagues looked at me, smiled and said, “That’s not something you get to do every day.” No, it sure wasn’t. Our server, returning to work, wheeled over the cheese trolley. He opened the cover, then, pointing to a beautifully ripe, white-rind cheese, he said that the Pont l’Évêque was especially good that day. We all agreed, and I picked up the wine list to find a red wine. On the way back to the hotel, Peter and I shared a taxi. At one point he asked, “Don’t you wish you had brought a bottle of Neyers wine to give to M. Bocuse?” The thought had never entered my mind. Later, at dinner, I told Peter that if I ever went back to Restaurant Paul Bocuse, I would take a bottle of our Chardonnay ‘El Novillero Vineyard’ to him as a gift. Of course, he didn’t need to try a Chardonnay from California – or any other place for that matter. The list in his Lyon restaurant was loaded with some of the great White Burgundies of France. After all these years of tasting many of them, though, I’d like to think Tadeo’s work would have intrigued him, if only a little. But then it might have also led to yet another remarkable impromptu moment like the one in Paris. Our parcel of this vineyard was developed by Chuy using budwood from the old Joe Swan vines in Forestville. That budwood originated in Vosne-Romanée and was brought to California by Joe in the early 1960’s. 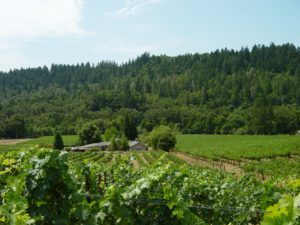 It was not heat-treated and serves as a direct connection between Burgundy and the Russian River Valley. It remains a fascinating anomaly in today’s California vineyard scene. Our parcel of this vineyard was developed by Chuy using budwood from the old Joe Swan vines in Forestville. That budwood originated in Vosne-Romanée, and was brought to California by Joe in the early 1960’s. It was not heat-treated, and serves as a direct connection between Burgundy and the Russian River Valley, and it remains a fascinating anomaly in today’s California vineyard scene. A Glass of Neyers Chardonnay with Tony Curtis: What a Wonderful Night it was! I’ve been spending some time going through my film collection lately, pulling out some old favorites for Barbara and me to watch, and I was especially pleased to run across a dusty VHS copy of ‘Operation Petticoat’ last week. This legendary film was a huge box office success when it was released in 1959, and a quick check on the internet reports that it was the third top-grossing film of the year. Moreover, it was the biggest financial success in Cary Grant’s long career. But it’s Tony Curtis who steals the show in this film, as Navy LT Nick Holden, a submarine supply officer who raises the art of military scrounging to new lows. In an interview just before his death in 2010, Curtis referred to it as one of his favorite roles. It was certainly one of mine. I could watch the film repeatedly and never tire of it. I could also listen to Tony Curtis talk for hours, without growing weary of his voice, or that enormous charm. On a night that seems like it was only a few years ago, on the road selling wine in Los Angeles, I was able to experience both. I was traveling that week with two French winemakers – one from Alsace, the other from the Loire – and after stops in New York, Chicago and Denver we arrived in LA, nearing the end of our trip. Both winemakers remarked how excited they were to be visiting Los Angeles. I wondered if they would still feel that way when we left! Fortunately they both spoke fluent English. We hooked up with our distributor at the airport, then checked into our hotel, before heading off for some sales calls. We finished our work day with a promising-sounding dinner at what would be my first visit to the ‘new’ Spago, an old favorite which had recently moved to fancy new digs in Beverly Hills. When we arrived at Spago, though, we learned that our host had failed to reconfirm his reservation, so it had been canceled. No problem said the wine buyer. He knew us, and simply asked that we get comfy at the bar while he found us a four-top – on a Friday night. At the bar, we learned that the Neyers Carneros District Chardonnay was on the list, so I ordered a bottle while we waited. After an hour or so, we were reassured by the wine buyer that we needed to be just a bit more patient. 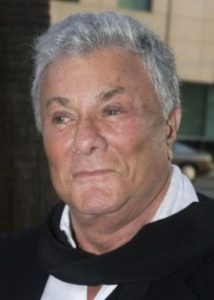 That’s when I noticed someone at the end of the bar who looked a lot like Tony Curtis. He was talking with the bartender, and both were laughing. While his hair was white, his face was unmistakable — just as strikingly handsome as I remembered him from the peak of his career. To be certain though, I asked the bartender – who had become a good friend by then – and my suspicions were confirmed. We ordered another bottle of Chardonnay and the bartender asked if we wanted to send a glass to Mr. Curtis. He likes Chardonnay, we were assured. I agreed, immediately. Tony huddled with the bartender — getting some information on who we were – then glanced over at us, took a sip, smiled and waved us all down to his end of the bar. We joined him, and a short but wonderful spontaneous party ensued. My French producer friends are probably still puzzled about the world of Hollywood, where you meet famous actors while selling wine. We finished that bottle and Tony ordered another one, all the time lauding the wine as one of the best he’d ever encountered. I was dizzy basking in the praise, while my traveling companions were having him sign Spago bar napkins to everyone they knew. We all felt like we were hanging out with an old family friend. Eventually his dinner companion arrived, and about that same time the wine buyer found a table for me and my companions. Looking back, the hour or so that we stood at the bar and talked with Tony Curtis, drank a bottle or two of wine, and fielded his questions about our lives in the wine business were extraordinary. Watching the first few minutes of ‘Operation Petticoat’ returned me to that evening. For someone who could list among his film credits such classics as ‘The Defiant Ones’ –- for which he was nominated for an academy award — ‘Some Like It Hot’, and ‘Operation Petticoat’, he was the most genuinely modest superstar I ever met. On top of that, he seemed to love Neyers Chardonnay. I’ll always remember him as that likeable guy I met at Spago who deflected every question I asked him in order to turn the conversation back on me. My two French suppliers returned home the next day, their suitcases stuffed with autographed Spago bar napkins. Barbara and I went to Spago for dinner last month, and we were pleased to see they currently feature Neyers Carneros District Chardonnay by the glass. If you find yourself in Los Angeles, keep that in mind, and stop in for a taste. I’m sure you’ll enjoy the wine, and maybe you’ll create some of your own memories. There are bound to be plenty more of them there. This is indeed good news, as word just arrived from the Editorial staff at ‘The Wine Enthusiast’, reporting that they tasted our newly released 2017 Chardonnay ‘304’, and scored it 91 POINTS. Now there’s a sound decision! The ‘304’ Chardonnay from Neyers Vineyards takes its name from the type of stainless steel that is used to make wine fermentation tanks. It’s the highest of the ‘Food Grade’ levels of stainless, which makes it well suited for a range of wine related tasks. We also use one of our cement tanks to ferment a portion of this wine, but at no time does this wine come into contact with oak. The grapes come largely from Paul Larson’s Carneros District vineyard, which may well be the coldest climate Chardonnay grown in northern California. Moreover, the vineyard is planted on the rocky outcropping of a former creek bed that provides the finished wine with a lovely mineral component. Fresh, bright and crisp, this is a wine that is full of flavor, easy to drink, and goes well with almost everything. This review will be included in their November ‘Holiday Issue’.